New science research published in the Science section of the Telegraph looked at the real impact of an ageing population. Post World War II baby boomers (born between the mid 1940's and early 1960's) are expected to live far longer after retirement. Academics from the International Institute for Applied Systems Analysis (IIASA) in Vienna, Austria, argue that old age should be measured not by age, but by how long people have left to live. A recent estimate by the Office for National Statistics suggests that the average retiree can look forward to drawing their pension for up to 24 years – as much as 50 per cent longer than their parents' generation who fought the Second World War. Instead researchers say that old age should be defined as having fifteen or fewer years left to live. This has the implication that baby boomers are still middle aged until their 74th year. An average man who retired in 2012 (more or less like me) can expect to live until the age of 86.2 years. The ONS estimates that a woman who turned 65 on 2017 would have 23.9 years still to live on average reaching the hopefully healthy age of 89. As it says in the Brad Paisley song, "somewhere statistics show, The man's always the first to go - And that makes sense 'cause I know she won't be ready." Who knew! In addition according to International standard ISO 860, Monday is also the first day of the week. On that particular Monday morning the sky revealed that a new spring storm was on the way. It was the beginning of a new season with fresh weather to enjoy. Now for the weather - the sky was overcast cirrostratus with the deformation zone leading the warm conveyor belt that was already far to the east and low on the horizon. There were some subtle gravity waves in this thin and stable ice cloud. The patches of altocumulus were also preceded by a deformation zone at that particular level of moisture. The warm conveyor belt would bring more moisture across Singleton Lake. Soon there would be enough layers of moisture in the vertical that the cloud would meld together to produce rain. Perhaps it might rain on my parade but it wouldn't erase the smile from my face. The saying "red sky in morning, sailor's take warning" would apply in this case even though neither the sky or the clouds were very red. This is the view from the southern edge of the Opinicon looking northeastward through the shore line trees toward the Lodge. There was a stand of red oak trees mixed in with some pines. The cabins of the Opinicon Resort peeked through the trees and added jabs of characteristic bright colour. The shadows of the trees trailed to the northeast across the uneven and sandy soils. Every tree is an individual and if you look, you will find these trees in real life. I don't make anything up but sometimes content does get strategically removed. The late morning sun was in the southern sky and as high as it gets on the last day of meteorological fall. Meteorological winter begins on December first. The difference is between meteorological and astronomical winter is that astronomical is based on the location of the earth with respect to the sun. Meteorological winter is defined by the coldest 3-month period of the year. The shadows were long. It was windy and cold and I decided to play with the oils in the studio instead of being buffeted by the chilly winds and rain showers. #2045 "Opinicon Cabin Through the Oaks"
The new owner gave me a tour of the Opinicon Lodge and briefed me on all of the work that had been done. It is always harder and more costly to repair existing structures. Our talk reminded me of my good friend George Craib who took time on a spring evening to come up and visit Linda and I. He offered to blend the old farm house and to give us the chance to start from scratch. He was right of course. We were in a bit of a corner but looking back, his advice was wise and sincere. We should have followed it. This is the view from the southern edge of the Opinicon looking northward through the shore line trees toward the Lodge. The late morning sun was in the southern sky and as high as it gets on the last day of meteorological fall. Meteorological winter begins on December first. The difference is between meteorological and astronomical winter is that astronomical is based on the location of the earth with respect to the sun. Meteorological winter is defined by the coldest 3-month period of the year. The shadows were long. It was windy and cold and I decided to play with the oils in the studio instead of being buffeted by the chilly winds and rain showers. #2044 "Through the Opinicon Forest"
I paddled to the Opinicon when I became a teenager for the first time to get ice cream from the store beside the Liar's Bench. This long seat was the place where fishermen swapped stories - some of which might have been true but most were greatly exaggerated. I paddled there many times again on dates with my future bride... and then again with our kids. I taught the kids how not to rub the paddle along the side of canoe and to stroke silently. You saw more nature that way. Something of quality need not change with the times. I have known this place for a lifetime and am relearning it as I become a teenager again. This is the view from the southern edge of the Opinicon looking out through the shore-line trees across Sand Lake. The late morning sun was in the southern sky and as high as it gets on the last day of meteorological fall. Meteorological winter begins on December first. The difference is between meteorological and astronomical winter is that astronomical is based on the location of the earth with respect to the sun. Meteorological winter is defined by the coldest 3-month period of the year. It was windy and cold and I decided to play with the oils in the studio instead of being buffeted by the chilly winds and rain showers that were occurring outside. I was staying at the White Birches Cottages on Oxtongue Lake in support of the Oxtongue Lake Arts and Culture September 2017. 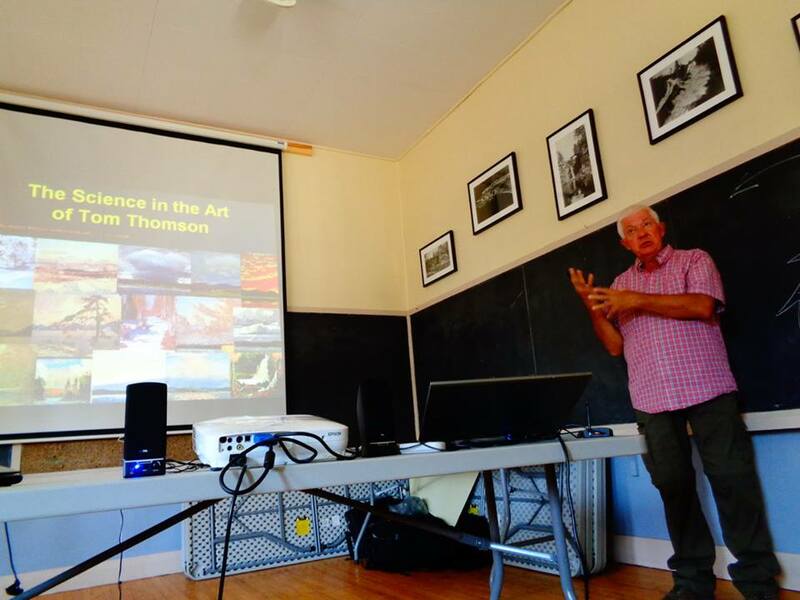 There was a request for a couple of presentations of the Art and Science of Tom Thomson so I gladly obliged. The presentations went very well even though it was a really hot day for late September. Myself and the attendees sweated more than just a little bit. On the Sunday morning after the presentation I was out for an early morning wade and swim in the still pleasant waters of Oxtongue Lake. This is the view looking northeast toward the early morning sun from out in the lake at 7:30 am on Sunday the 24th of September 2017. There was no one else around. 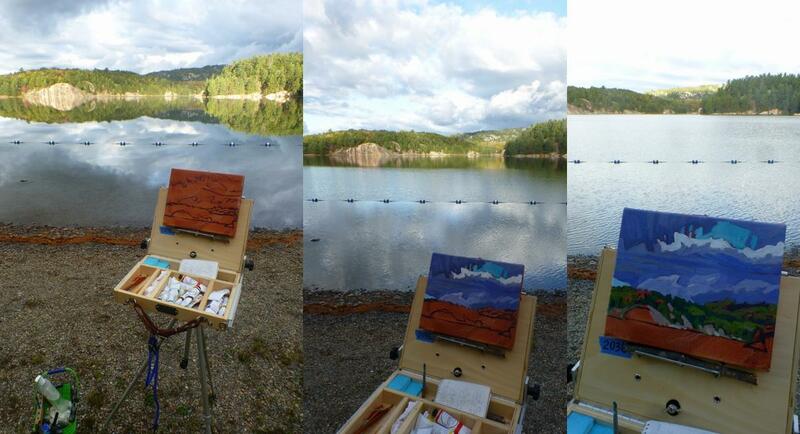 I was up to my waist in the lake and it would have been challenging to position my easel from this vantage point. There was some morning fog cloaking the distant hillsides. The Muskoka chairs were still empty. In the autumn of 2017 I had been on a drought from painting. A lingering cold and cough plus the chores and getting ready for the coming winter got in the way of the easel. I started up this painting in the Singleton Studio on Sunday November 19th, 2017 to try to get back into the groove. This is a very smooth and slippery surface. The paint was old and thick and thus the brush strokes are very textured - just the way I like them. #2042 "Killarney Stormy Night at Dock"
The 2017 Southampton Art School Annual Adventure was carrying on the legacy of my friend and artist Jane Champagne. This was the eighteenth demonstration painting and the first of Day 5 of the Plein Air Paint Out. It was a beautiful day. I wanted the last demonstration painting to be simple with no hiking or even any traveling. The waterfront of Killarney Channel in front of the Killarney Mountain Lodge was the perfect choice. As always I setup early and waited for the artists to arrive. Jojo and Judy watched a lot of this demonstration as it unfolded. Jojo interpreted what I was doing so I was able to stay more in the creative artistic zone. A painting can be a lot like a puzzle of shapes, tones and colours. The oils add texture to that list. 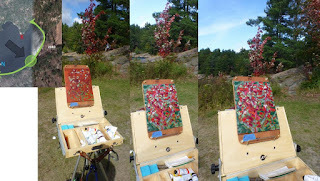 When painting en plein air with the pressures of time, sun and weather I continually have to decide which puzzle piece to put in next. One never knows how it will look until all of the pieces are assembled. The sail boat is the Stormy Night registered out of Toronto. It must have been part of the package deal with the Killarney Mountain Lodge which Maury and Annabelle sold to the new owners. The clean morning light bathed the scene. I kept my colours clean by laying the proper colours in place and leaving those strokes alone. The waters of Shebahonaning were like glass. Killarney's original name was Shebahonaning and it means "safe canoe passage". It would have been enjoyable to paddle through the calm and mirrored surface of Killarney Channel. #2041 "Killarney George Lake Cirrus"
The 2017 Southampton Art School Annual Adventure was carrying on the legacy of my friend and artist Jane Champagne. This was the seventeenth demonstration painting and the sixth of Day 4 of the Plein Air Paint Out. Most of the artists were pretty much painted out. Dale was still painting the Cranberry Bog across the road so I stayed. The wind had weakened a bit. Cirrus was pouring across the flat ridge with the jet stream winds. I wanted to give the George Lake shoreline one more interpretation on this small and very textured surface. My oil paints were getting thick and a bit gummy after four days of being exposed to the sun and the wind. That was still way better than the acrylics that most were using. Those man-made plastic paints dried before they could put a brush into the mixed pool of plastic. The very rough panel may be small but it allowed me to capture the moment in the weather. The lines and edges in the cirrus clouds tell the tale of the wind. The clouds are translating eastward with the average flow but it is the relative flows within the atmospheric frame of reference that do the sculpting of those edges. All of these edges are in fact cased by deformation zones and differential rotations. I have explained this within the Unified Swirl Theory and yes, the answer is blowing in the wind. Some of the trees were starting to turn into their autumn colours. 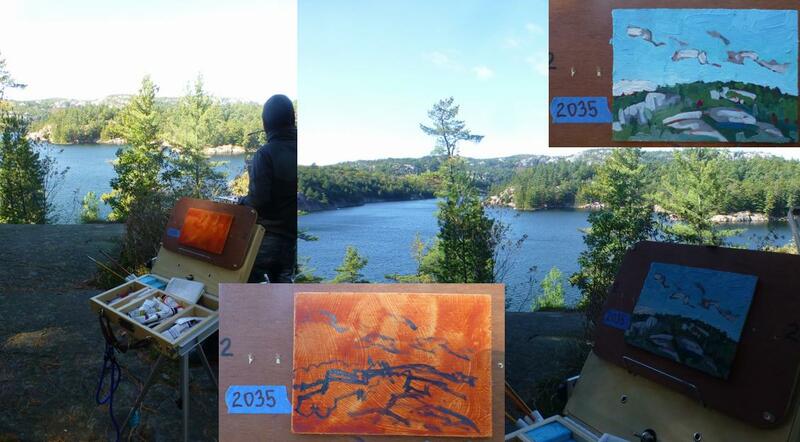 #2040 "Killarney in the Fall"
The 2017 Southampton Art School Annual Adventure was carrying on the legacy of my friend and artist Jane Champagne. This was the sixteenth demonstration painting and the fifth of Day 4 of the Plein Air Paint Out. When the group arrived they set up at the cyclonic branch of the deformation zone beach so I moved to be with them. This was going to be a windy location with the westerly fetch of blustery winds off George Lake. It was more important to be with the group than to seek sheltered comfort. At breakfast I had pointed out that the isobaric gradient was really quite weak so I was hopeful that the winds would not be an issue. The slight anticyclonic curvature of those flat ridge isobars and the cold air advection overpowered the gradient wind and it was indeed windy and even a bit chilly. Now for something completely different. I turned away from the water toward a soft red maple clinging to life on the edge of a granite ridge. The wind was turning the leaves over and exposing the pale green under-sides. The red and orange colours of the leaves were in constant turbulent motion. The scene was a tangle of textures, shapes and colours so that is what I painted. It was a very smooth surface so one had to lay the colours on the slippery panel and leave them alone. The painting surface is heavily textured. #2039 "Killarney Cold Air Mass Cumulus"
The 2017 Southampton Art School Annual Adventure was carrying on the legacy of my friend and artist Jane Champagne. This was the fifteenth demonstration painting and the fourth of Day 4 of the Plein Air Paint Out. When the group arrived they set up at the cyclonic branch of the deformation zone beach so I moved to be with them. This was going to be a windy location with the westerly fetch of blustery winds off George Lake. It was more important to be with the group than to seek sheltered comfort. At breakfast I had pointed out that the isobaric gradient was really quite weak so I was hopeful that the winds would not be an issue. The slight anticyclonic curvature of those flat ridge isobars and the cold air advection overpowered the gradient wind and it was indeed windy and even a bit chilly. I turned the small, smooth and slippery surface on edge to make a portrait format of the landscape. The same shoreline of George Lake can appear quite different when looked at in a different way. It is always good to step out of your comfort zone to see what might happen. Every painting is an adventure and an experiment to maybe learn something new. With daytime heating the stratocumulus were becoming more vertical in the unstable cold air mass behind the cold front. It was chilly when the clouds intercepted the heating radiation from the sun. These cumulus were looming as they tumbled over the hills of La Cloche. 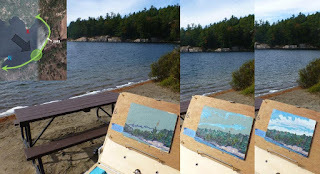 #2038 "Killarney George Lake Northeast Shore"
The 2017 Southampton Art School Annual Adventure was carrying on the legacy of my friend and artist Jane Champagne. This was the fourteenth demonstration painting of the Adventure and the third of Day 4 of the Plein Air Paint Out. When the group arrived they set up at the cyclonic branch of the deformation zone beach so I moved to be with them. This was going to be a very windy location with the westerly fetch of blustery winds off George Lake. It was more important to be with the group than to seek sheltered comfort. At breakfast I had pointed out that the isobaric gradient was really quite weak so I was hopeful that the winds would not be an issue. The slight anticyclonic curvature of those flat ridge isobars and the cold air advection overpowered the gradient wind and it was indeed windy and even a bit chilly. This view across George Lake is on a small, smooth and very slippery surface. The colours of autumn were just starting to emerge through the green of the conifers. I wanted to demonstrate that sometimes less can be much more. Just a few strokes in a limited amount of time and space can still be rewarding. One can kill a painting with a thousand strokes and render it quite lifeless. I love the strengths and texture of oils and en plein air, there is nothing like them especially when buffeted by the elements. #2037 "Killarney George Lake Winds"
The 2017 Southampton Art School Annual Adventure was carrying on the legacy of my friend and artist Jane Champagne. This was the thirteenth demonstration painting and the second of Day 4 of the Plein Air Paint Out. When the group arrived they set up at the cyclonic branch of the deformation zone beach so I moved northward along the shore to be with them. This was going to be a windy location with the westerly fetch of blustery winds off George Lake - but it was more important to be with the group than to seek sheltered comfort. At breakfast I had pointed out that the isobaric gradient was really quite weak so I was hopeful that the winds would not be an issue. The slight anticyclonic curvature of those flat ridge isobars and the cold air advection overpowered the gradient wind and it was indeed windy and more than a bit chilly. The gravity waves in the patch of higher altocumulus cloud revealed that the wind was backing with height as it should with cold air advection. The weather was dominated by streets of turbulent stratocumulus aided by time and the instability created when cold air flows over the warm Great Lakes. Bands of cirrus were also spreading over what had to be a very flat upper ridge. The temperatures were comfortable in the mid teens when the sun was out between the cloud streets. It was definitively chilly when the clouds obscured the sun. I included the characteristic yellow rock in several compositions. The colours of the trees were emerging by the hour. I think the small and smooth panels really capture the essence of the place. The impression can be more truthful in those bold, unmixed and unpolished strokes of pigment. This skyscape makes the clouds the star of the small screen. The western shore of George Lake on the horizon was just a small player in the composition. Plein air is always fun. I scratched my signature in the wet oils with my trusty nail. Traffic was increasing as visitors arrived for the Thanksgiving Day weekend and the autumn colours. #2036 "Killarney George Lake from the Beach"
The 2017 Southampton Art School Annual Adventure was carrying on the legacy of my friend and artist Jane Champagne. This was the twelfth demonstration painting and the first of Thursday and Day 4 of the Plein Air Paint Out. 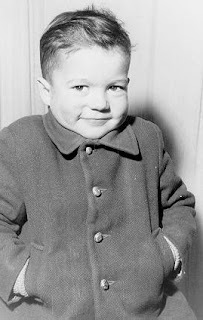 We had arranged to meet at the eastern beach of George Lake and I said I would be early as always. The shape of this beach is characteristic of a deformation zone and I am certain that the fluid flows that create deformation zones in the atmosphere are identical to the flows of molten rock that created the shape of George Lake Beach and the surrounding hills. 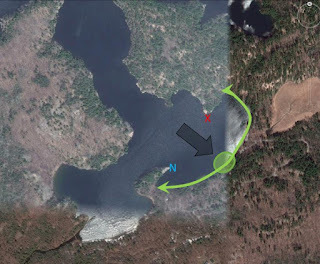 These circulations occur in three-dimensions even though we focus on the horizontal cross-sections which in this case was provided by gravity and the water of the lake. It was a quiet morning and calm when I started to paint. 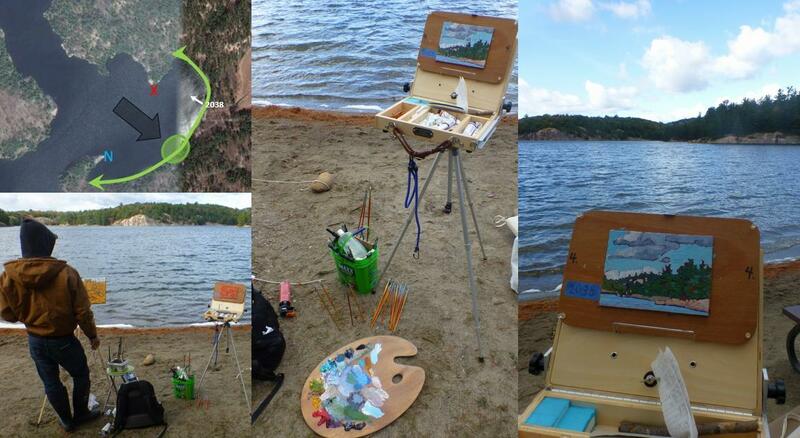 I set up and was painting shortly after 8 am on the eastern beach of George Lake. The lake was calm under the radiational inversion. That would be quick to change with even the modest daytime heating. The gradient was supposed to be light looking at the isobaric charts but the continued cold air advection was unmistakable. The clues of the wind that would arrive were evident in the cloud but for now the waters of George Lake were still calm. A mink came hunting along the waters edge. I was too slow and it was too cautious so I was not able to record its visit to the easel. A flock of white crowned sparrows also picked up seeds from the shore. 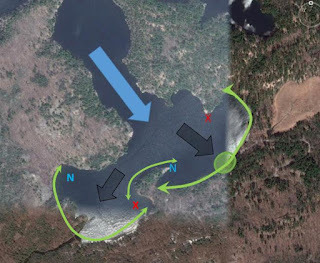 I suspect that they had learned that the wind and waves were reliable partners in directing the seeds that landed on the water of George Lake. Seeds lined the sandy edge and they made for an easy breakfast. Patches of blue sky appeared between the streets of turbulent stratocumulus. The air mass was cold enough to occasionally support snow virga. Those winds revealed by the turbulent clouds had not yet made it to the surface when I started. The radiational inversion broke down before I was done so I painted those winds and waves with the lack of glassy reflection into the scene. #2035 "Killarney La Cloche Quartzite"
The 2017 Southampton Art School Annual Adventure was carrying on the legacy of my friend and artist Jane Champagne. This was the eleventh demonstration painting and the fourth of Day 3 of the Plein Air Paint Out. The artists were all in the same area and we bantered back and forth a lot while trying to stay in the artistic creative zone. The weather of the cold frontal trough had moved well to the east and it was a beautiful autumn afternoon. Everyone was having a great time although the shadows from the forest behind us on the ridge were obscuring the colours on our palettes and canvases. One needs to have light in order to really see the colours. 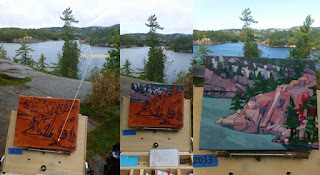 This is the partner to #2034 "Killarney La Cloche Ridge" where I suggested painting a scene that was so far away that you could not see any detail anyway even if you wanted to. Detail was getting in the way of some of the artists preventing them from really seeing the shapes and colours of their scene. 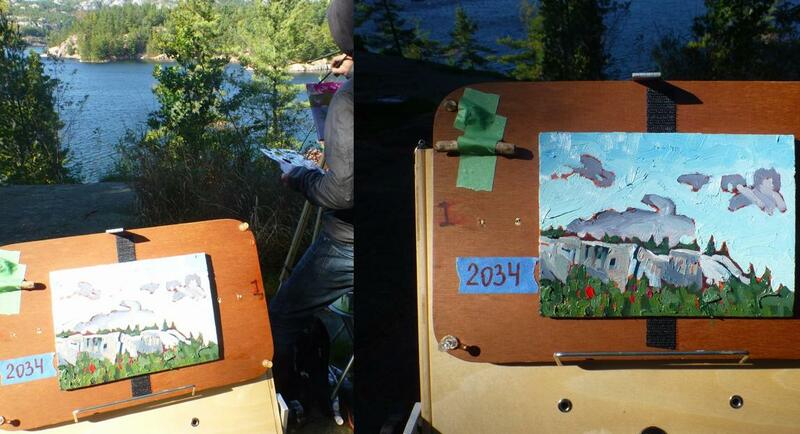 The view is shifted to the west from the composition of #2034. I always marvel at the colours and shapes of the La Cloche quartzite. I Googled some background information. Quartzite (from German: Quarzit) is a hard, non-foliated metamorphic rock which was originally pure quartz sandstone. Sandstone is converted into quartzite through heating and pressure usually related to tectonic compression within orogenic belts. This causes streaks and lenses to form within the quartzite. 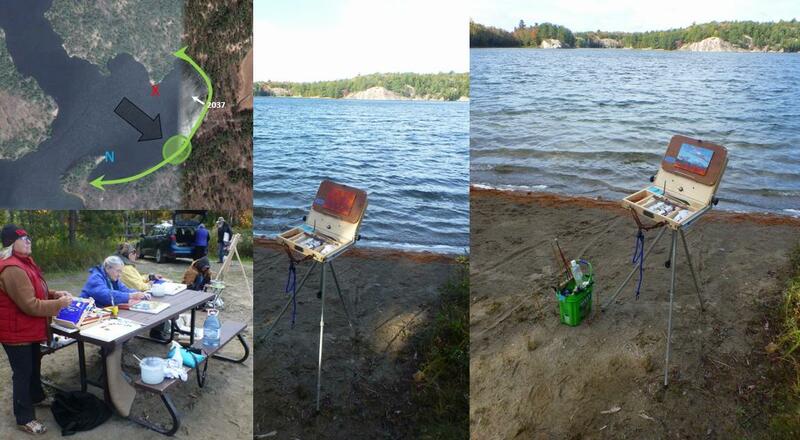 Killarney is a great place to paint en plein air. #2034 "Killarney La Cloche Ridge"
The 2017 Southampton Art School Annual Adventure was carrying on the legacy of my friend and artist Jane Champagne. 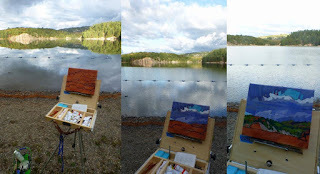 This was the tenth demonstration painting and the third of Day 3 of the Plein Air Paint Out. The artists were all in the same area and we bantered back and forth a lot while trying to stay in the artistic creative zone. The wind was still blustery but the post cold frontal stratiform rain had stopped. The skies were clearing and becoming dominated by streets of turbulent stratocumulus aided by daytime heating and the low level instability created when cold air masses flow over the warm waters of the Great Lakes. Bands of cirrus were already starting to spread over the flat upper ridge. Another system was already on its way. 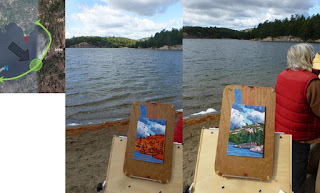 I wanted to have some fun by painting on a small and slippery surface and making a composition out of something very far away like the crest of the La Cloche mountains. Some of the artists were becoming embroiled within the abundant detail to be found while plein air painting. There is too much information to include in every painting. The light and the weather does not allow the time to create a photographic rendition of the scene. In any case as artists, the last thing we want to do is to interpret the scene like a camera. I attempted to assist by explaining the advantages of squinting your eyes, using larger brushes and painting quickly. Finally I suggested painting a scene that was so far away that you could not see any detail anyway even if you wanted to and had the eyes of an eagle. This demonstration was my attempt to drive that last approach home. This is the partner to #2035 "Killarney La Cloche Quartzite". You might notice the stick taped to the board supporting the small panel. One of the plastic thumbtacks that keep the panels separated while in the canoe pack broke. The stick performed the same task and kept the panels from touching each other and making a mess of the very thick and very wet oils. The panels allow me to paint to the very edge while never touching the painting again until it is very dry. #2033 "Killarney George Lake Sentinel"
The 2017 Southampton Art School Annual Adventure was carrying on the legacy of my friend and artist Jane Champagne. 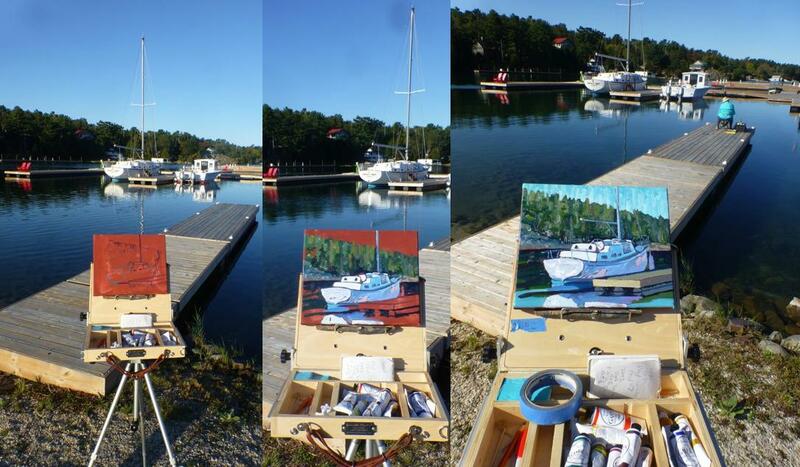 This was the ninth demonstration painting and the second of Day 3 of the Plein Air Paint Out. The artists were all in the same area and we bantered back and forth a lot while trying to stay in the artistic creative zone. The wind was still blustery but the rain had stopped. I focused on the characteristic rock on the eastern channel between the two basins of George Lake. There was one rock at the water's edge that looked yellow so I thought I would do a composition which highlighted it. Killarney canoeists will recognize that rock. That rock is the sentinel mentioned in the title.